Decorative concrete involves utilizing concrete in roles that are not strictly related to its functional elements. Concrete is known for its great strength, especially when combined with steel rebar. Concrete can be used for, among other things, walls, floors and countertops that are structurally sound and also provide a decorative finish that resembles polished stone, with less cost for materials. Color material is blended with the concrete mix to color the aggregate throughout. Many of the colorants are iron oxides and can create colors including blacks, yellows, and reds. Greens can be achieved using chromium, and ultramarine can be used to create variants of blue. Some of the compounds used to create coloring are heavy metals (including chromium) and can be released during the grinding and polishing of the concrete. These heavy metals can cause severe respiratory problems and environmental damage. New advancements in integral concrete color do not utilize conventional iron oxide based pigments, virtually eliminating efflouresence and alkali discoloration by using "synthetic primary pigments" SYPP. These synthetic primary pigments are available in liquid emulsion form and are highly concentrated for ease of use and economic savings. SYPP are available in all primary colors. SYPP are also blended with extenders and preservatives to increase the color offering to include most earth tones. Rubber imprinting tools called "Stamps" are impressed into wet concrete slabs or overlays to create natural stone or brick textures. These rubber imprinting tools are manufactured from molds created from authentic stone or wood. Release agents are used to help release the stamps from the concrete without sticking. Release agents come in either a liquid or powder form. Items can be embedded in the concrete for practical purposes (such as brass rails to serve as pot holders on a countertop) or aesthetic ones (such as decorating with shells or fossils). Concrete "dyes" take many different forms and compositions. Early concrete dyes consisted of generic printing inks that were dissolved in mild solutions of alcohol and applied to concrete surfaces to add a wide array of color to plain gray concrete. When alcohol-based dyes are exposed to sunlight, the color either lightens or fades out completely. Therefore, alcohol-based dyes were more prevalent in interior applications where direct sunlight or other forms of ultraviolet (UV) lighting was not present. Manufacturers later began dissolving the same printing inks in different carriers, such as acetone, lacquer thinner and other solvents, hoping to achieve increased penetration levels. In addition, UV inhibiting agents were added to new dyes to help with the UV instability issues. However, fading still occurs when the dye is exposed to sunlight. Acid staining is not a dyeing or pigment-base coloring systems, but a chemical reaction. A mixture of water, salts and acid is applied to the concrete surface and later neutralized by a basic solution of ammonia and water. This chemical reaction with the existing minerals (primarily lime) in the concrete creates new colors on the concrete surface. Due to inconsistencies in the surface of concrete, acid staining creates a variegated or mottled appearance that is unique to each slab. The thickness of this color change ranges from 1/16 to 1/32 of an inch. Exterior concrete surfaces may not color as well as interior surfaces because the environment has leached or percolated out the mineral content. As well, any exposed aggregate (rocks) in worn concrete will not accept staining. Chemicals commonly used in acid staining include Hydrochloric acid, Iron chloride and Sodium bicarbonate. Water Based Stains are similar to acid based stains in the sense that one can still achieve a translucent look like acid; some stains are able to achieve an opaque color and/or a translucent effect. The main difference is that acid stains react to the concrete and change the physical make up of the concrete material, whereas water based stains are more of a "coating" that bonds with the concrete. There are many variations of water based stains that have come into the decorative concrete industry that perform in a number of different ways. Some are polymer based, acrylic and epoxy. Concrete overlays date to the 1960s when chemical engineers from some of the larger, well known chemical companies began to experiment with acrylic paint resins as modifiers for cement and sand mixes. The result was a thin cementitious topping material that would adhere to concrete surfaces and provide a newly resurfaced coating to restore the worn surface. Concrete overlays lacked the long term performance characteristics of acrylic resins. Acrylic resins provided good UV resistance, but lacked long term water resistance and adhesion characteristics needed to provide a long term and permanent solution. Polymer cement overlays, consisting of a proprietary blend of Portland cements, various aggregates and proprietary hybrid polymer resins, were introduced over 20 years ago. The purpose of adding a hybrid polymer resin to the cement and aggregate is to greatly increase the performance characteristics and versatility of conventional cements, mortars and concrete materials. Unlike conventional cement and concrete mixes, polymer cement overlays can be applied thinly or thickly without fear of delamination or typical product failure. In addition, polymer cement overlays are much more resistant to damage from salt, petrochemicals, UV, harsh weather conditions and traffic wearing. 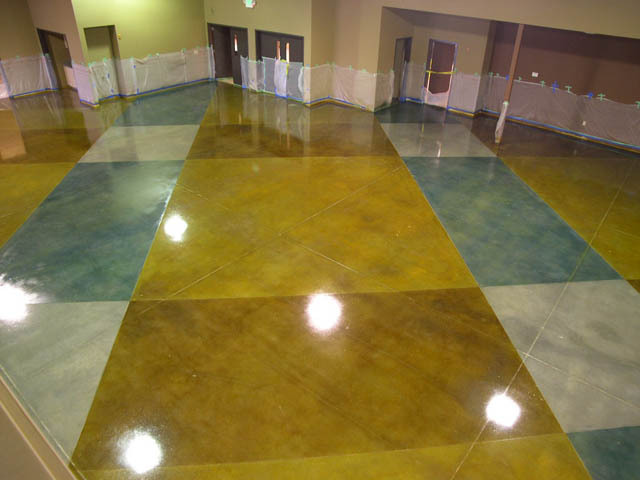 * Skim coat/broom finish concrete resurfacing – Restore and protect damaged, pitted, flaking and stained concrete back to the look of a new concrete surface. * Concrete regrading & leveling – Repair and level concrete surfaces that have settled. * Existing substrate redecorating and renovating – Alter the appearance of existing concrete or wood substrates through applying "thin stamped" or "thin stained" overlays, creating new textures, colors and designs. For use on commercial or resident pool deck, this frequently takes the form of "splatter textures" or "knockdowns," in which polymer cement is applied to the existing concrete substrate in a moderately textured finish (average of 1/8” thickness) in various patterns. 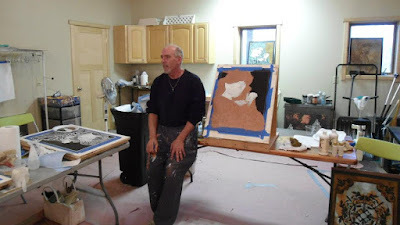 Often, the texture is knocked down with a trowel to slightly modify the appearance and feel of the finished application. Concrete can be polished with Mechanical grinders and diamond pads of increasing grit sizes. Diamond pads come in many grit or mesh sizes. Common sizes start with 6 grit and can go up to 8500 grit although concrete can only maintain a shine of about 800 grit, it can be helped by adding a concrete hardener such as Sodium Silicate, Lithium Slicate which will allow concrete to hold a 1800 through 3000 grit shine.The work is accomplished in multiple stages by passing over the concrete with successive grit diamond pads until it has a hard-glassy finish. Both acid stains and concrete dyes can be used during the polishing process.